Tagged Faculty Union (United Academics of UO), Jamie Moffitt. Bookmark the permalink. How would one go about satisfying that burden of proof? I wonder if there’s case law on the subject of whether and how this sort of exemption language applies to public agency budget projections? 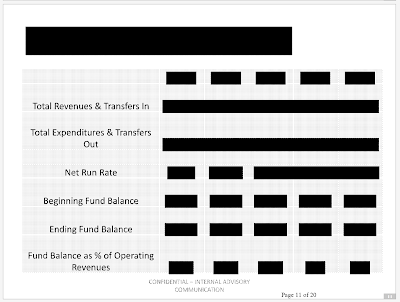 Gottfredson and Moffitt kept the meeting closed and then redacted the report so they could hide UO’s true budget situation from the faculty union. Asst and assoc profs here are doing better than their UCSB peers in California due to the lower cost of living here. And that’s also probably true for full professors, even though the salary gap is wider with about $26K more per year in the UCSB paycheck. In the Santa Barbara area, asst and assoc profs couldn’t afford to buy a dog house there on what UCSB pays them. What a relief–the state with the greatest budget crisis in the country may not beat us after all. That only leaves UIowa, UMich, UVa, UNC etc. to worry about. While I’m no economist, it seems like you would want to adjust wages for quality of life differences in Santa Barbara as well in addition to costs of living. The reason costs of living are high is because it is never warmer than 80 degrees, and rarely colder than 55. And it rains only about 1 in 20 days. So unless it catches on fire, its a paradise, with the many offices on campus having a spendid view of the ocean. So to really measure differences in wages one would need some sort of hedonic wage regression, at least I think that’s what some folks call it. While its not like I went to graduate school there, they also had faculty housing at a subsidized rate, and also how housing assistance programs where the university would pay 50,000 in a down payment (might be more now), and in some cases also paid to lower the interest by up an additional percentage point or two. Likewise, they also opened up family student housing to new professors for the first three years, which had 2-3 bedroom units available at a subsidized price. Boulder has a similar housing program offering up 80,000 in an interest free loan one can use as a down payment. What does the UO have???? Our department lost a potential recruit to Santa Barbara a few years ago on the grounds that the cost of living was *cheaper* there once UCSB’s housing subsidy was factored in. So at least in this statistic, I think we can say that the UO has achieved our goal of getting to the average of our comparators. Given there was this tiny little thing called a housing bubble that caused a tiny little thing called the Great Recession, maybe the cost of living indices could use updating if they were last calculated in 2008 which is at the beginning of the housing crash in most states. The numbers I posted are the current cost of living indices, compared to the national average. I don’t think the rankings shifted much, as UNLV isn’t one of our comparators. 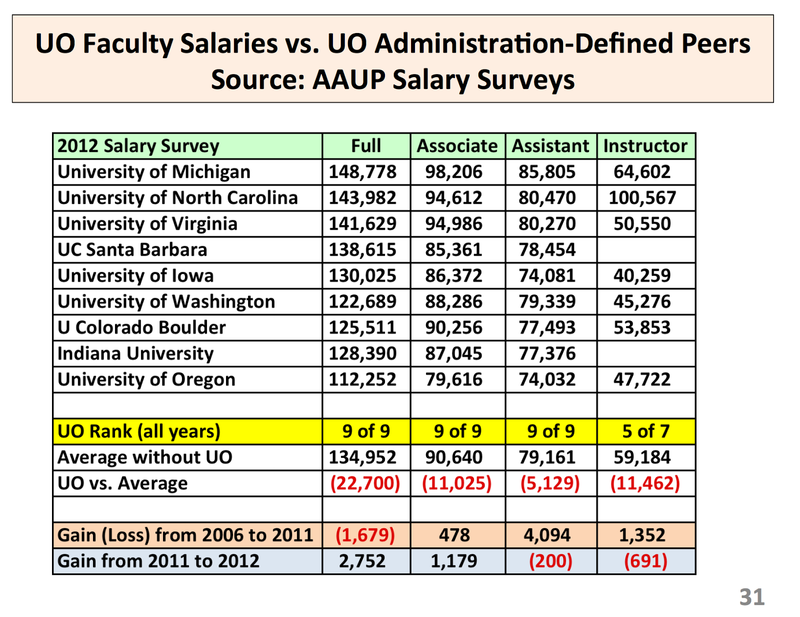 Another issue is the UO does not have a large engineering school, these faculty tend to be paid significantly more, thus raising the average of schools like Michigan, UCSB, etc… UO salaries are somewhat low, but not nearly as bad as is often claimed. Furthermore the UO retirement benefits are a lot better than many other places. I’ll post the data by department and rank later today. The gaps extent to most disciplines. There’s some truth to your benefits point, particularly for those hired before 1996, who are PERS tier 1. In the salary analysis conducted for the Lariviere/Bean/Tomlin salary equity proposal, academic discipline, rank, and even years at rank were factored in. So which departments exist on each campus has no effect. This procedure was in line with the SBC’s update of the White Paper, as the prior goal was stated in terms of university-wide comparisons, and this prior approach didn’t account for some departments doing quite well while others were doing terribly, compared to other schools. Retirement benefits are harder to calculate with precision, as there so many different types of plans, etc. However, the L/B/T plan was adjusted for retirement benefits in one significant way: the 6% “employee contribution”, which the State started paying for employees back in the 1980s, in lieu of salary increases, is counted as part of salary when comparing the UO to other schools. Do other schools not have similar contribution plans? Or are they just also counted as salary for those schools if they exist? Other schools do have pension plans of some sort, but it’s much harder to directly compare retirement plans than it is salaries; there are so many variables that it quickly becomes apples and oranges. However, there is one index which can be pretty misleading – sometimes people look at the cost of retirement plans as a percentage of salaries. In that measure the UO comes out on the high end of the scale, which I think can be attributed to our relatively low salaries, and the relatively high costs of PERS. It seems to be that we’re not necessarily getting better retirement benefits, we’re just paying more for them. Further analysis would have to be done by someone who actually understands this stuff and can look at the data without going to sleep. I was just wondering that if the 6% contribution paid by the state is counted as salary, if other schools also have the employee part by the state, and if this is counted in the comparison. I looked up the U of Utah (https://www.hr.utah.edu/benefits/retire_401aPlan.php) and it looks like the state also pays the full amount of the 14.2% retirement contribution. 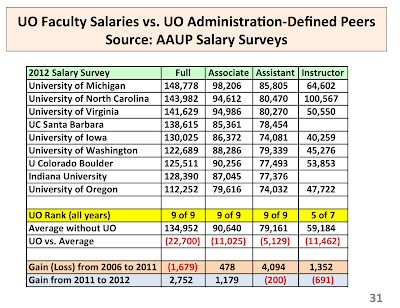 For new hires UO’s retirement contributions into the ORP (e.g. TIAA-CREF) are 6.21 + 6 = 12.21% of salary, all paid by UO. Tough to compare with comparators given all the defined benefit plans but it’s not that great a deal. Call it average. For PERS Tier 1 hired before 1996 – i.e. most of the fulls – UO’s plan is considerably better. But of course the legislature is hoping to change that. Bottom line, this does not come close to making up for the salary diffs.